I must confess to being a lazy blogger. Or perhaps, more accurately, a lazy photographer. I had knitting to talk about and no motivation to capture it on camera. It doesn’t help, of course, that we’re still in the midst of the winter blahs and the only chance I have to get decent pictures is on the weekends. For those of you despairing at my recent spate of finishitupitis, the end is near! I started something new! I’m also running out of WIPs and UFOs that I am definitely not going to send to the frog pond. 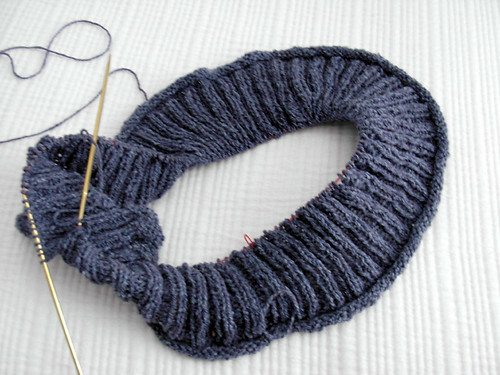 I’ve been evaluating my project list on Ravelry and have realized that I would really rather reclaim the yarn from some of the “sleeping” projects for patterns that have since grabbed my interest. Well, that and the socks were destined for frogging anyway, as they were victims of a severe gauge issue. After the evaluation, the only for-sure projects I have left are Alhambra and the Braided Pullover I started this fall. And um.. Alhambra is almost done. I’ve actually finished the knitting since the picture’s been taking, so all that remains are ends to be woven in and blocking. Severe blocking – this thing really pulls in on itself. Finished project coming soon. Braided Pullover is coming more slowly. 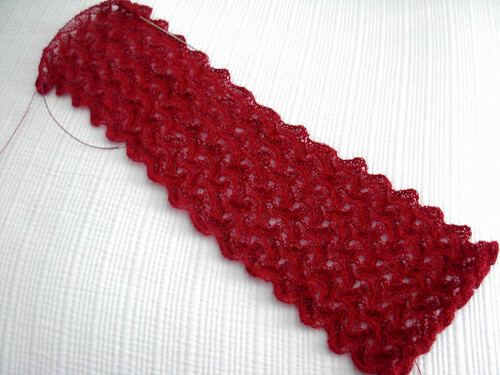 I’m still in the midst of the 4-1/4″ of ribbing, so I only pull it out when I need something pretty mindless to knit. Welcome “Girasole,” my newest obsession. Of course, I’ve made a good bit of progress since this was taken. I fell in love with the pattern the moment I first saw it on BrooklynTweed, but hadn’t really thought about it again until after this yarn arrived. It’s a cone of 100% cashmere laceweight (oh so lovely – although more so after the spinning oils are washed off), in just the right amount for the pattern. I like the warmth of the color for this pattern too. This is my first shawl knit “in the round,” which necessitated learning new technique – a circular cast on. At the pattern’s suggestion, I went to TECHknitting™’s instructions. And promptly encountered an issue I had not run into before: I’m left-handed. My right-handed grandma taught me to knit “English” without any difficulties. I later taught myself “Continental” without any real problems. But I just could not catch on to that cast on – until I gave up, held the yarn in my right hand, needle in left and just tried something. 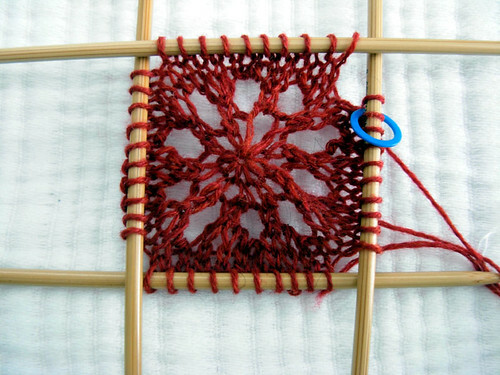 It worked – I had a perfect mirror of TECHknitter’s images, so I just had to flip the knitting over. Since I never had a left-handed knitting issue before, I was a mite surprised, but now that I have it figured out, I rather like the method. Although the first few rows were a bit fiddly, casting on circularly seems to work much easier than casting just a few stiches and trying to join them in a round. I’m really enjoying Girasole, too. There’s just one little problem…everytime I see the name, I get the song stuck in my head…! oooh I do love that scarf, looking forward to seeing it blocked. I like the colour you have chosen for the Braided pullover too. The way things are going, we may be finished about the same time! Looking forward to seeing more of the Girosole too, well done in sorting out the cast on issues.